Mother’s Day is quickly approaching so I thought I’d bring you some gifts to give your mom if you’re scrambling like I am! I’ve never done a ‘wishlist’ post but they seem like fun. 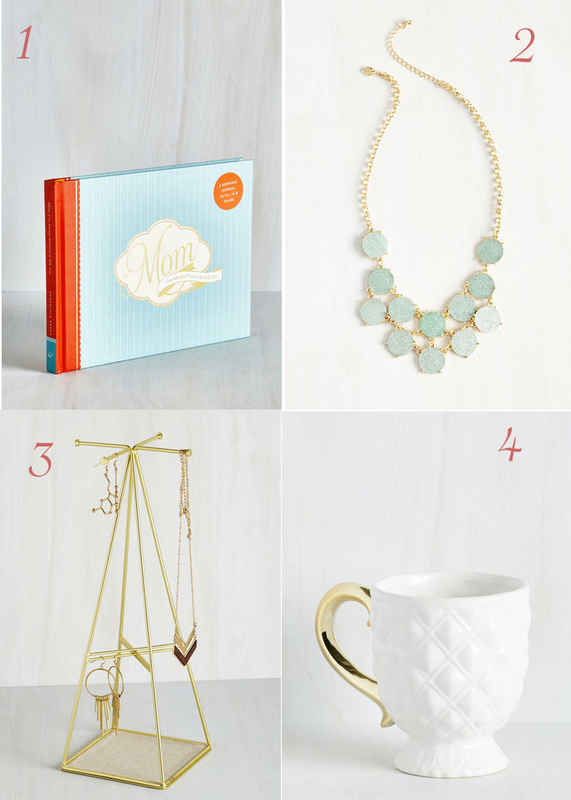 Modcloth is one my favorite stores so it’s definitely not hard to find the perfect gift (and maybe something for yourself!). It can get a little pricey but I think I’ve found a few pieces that are pretty budget friendly! Plus, I’ve thrown in a few other ideas in case you didn’t want to get a gift but do something else. I was browsing Modcloth and came across this book. It’s a journal with prompts on each page to recall a memory with your mom. It might be a little hard to fill in all the pages before Mother’s Day but you could definitely get it started! It could also be fun to fill it out with your mom. Or maybe get her a book she’s had her eye on for a while – it’s always nice to have a copy of your own of your favorite book. I really don’t think you can go wrong with a nice piece of Jewelry for mother’s day. Modcloth has tons of affordable necklaces and earrings and I think this sparkly necklace would be a perfect Spring/Summer addition to anyone’s wardrobe! 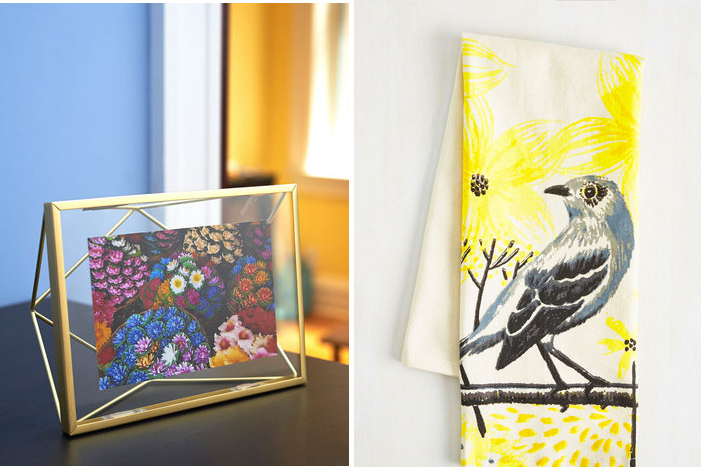 To go with her jewelry (or just alone), you could get your mom a cute jewelry stand. My mom loves getting these for other people as gifts (I have a really cute tree one!) so why not get her one of her own? My mom drinks coffee everyday so a really cute and elegant mug like the one above is a perfect gift! Another gift idea is getting a cute picture frame and putting a picture of the two of you in it! It’s always nice to have photos around the house and picking one with a great memory is always a good idea. We use mostly old rags at my house but why not spice up the kitchen with these cute tea towels?? And they’re only 10 dollars! If you’re close by to your mom…. Think about all the meals your mom has made you over the years. It can be nice to give your mom a break and make her a nice dinner. An important thing about mother’s day is spending time with your mom! Sadly, I live too far away so I can’t do that but if you are get outside and go to a local botanical garden, park, on a hike, etc. It’s Spring so the weather is perfect and it’s always fun to get out and see something new! 9. Give her a call! I’m sure many people are like me and live pretty far from their Mom. Make sure you give her a call and tell her how much you appreciate her!